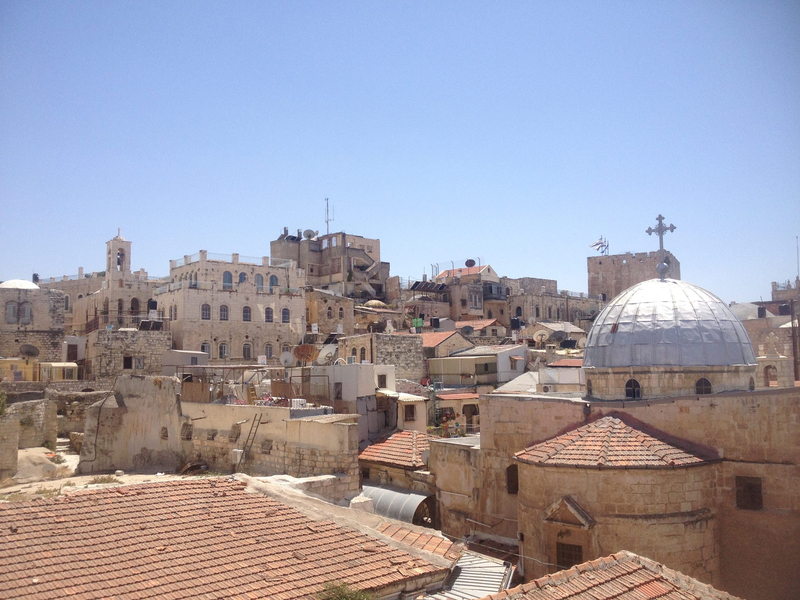 A shot one of my daughters took in Jerusalem. My two youngest daughters returned over the weekend from a friend’s wedding in Tel Aviv — that is, one is back home here, and the other is back in Bangkok. I was relieved when they were back in their respective homes. I didn’t really worry about them being in Israel on a rational level. Even when there is a terrorist attack in a given city on a certain day, 99.999 percent of the citizens are unharmed by it. When I think about the odds of coming to harm in a relative “trouble spot” in the world, I think of my experience covering the simultaneous fire and police strikes in Memphis in 1978. It was a huge national story, and if you followed it on TV you’d think the city was on fire, with no one to put the fire out or keep order. And yet, most people were entirely unaffected. I was in a Memphis restaurant at the start of the curfew imposed because of the “emergency,” and the customers being turned away were surprised and irritated — they thought it ridiculous. At one point, I found myself part of an impromptu press gaggle with a senior official on a street in Midtown. Tired of trying to press my way through the mob, and realizing I wasn’t really getting anything out of it, I stepped away. I walked across the street, and looked back. The clamoring knot of media types made it look like something exciting was going on. That was a shot that might make it onto TV news, if there were no fires to shoot. Then I conducted an experiment. I turned slowly around, my line of vision passing through all 360 degrees. And all around me was complete, unperturbed peace and order. Only in maybe five degrees was there disorder — and that would have decreased if I stepped a few more yards away. Ever since then, I’ve kept in mind that perspective whenever I think about the risks of being in a troubled country or city. So on that level, I didn’t worry about my daughters being in Israel — mostly in Tel Aviv and Jaffa, but with side trips to Jerusalem and the Dead Sea. I knew that they were probably safer there than in peaceful Thailand, what with the traffic in Bangkok (oh, I wish I hadn’t just thought of that). Besides, I didn’t see any reports of violence anywhere in the country while they were there. But that was just the rational level. I’m a Dad, so there was a tiny bit of irrational worry while they were there in a country surrounded by people who don’t want it to exist. At least four people were killed and five wounded in a mass shooting at an upscale market in Tel Aviv on Wednesday. CBS reported that police were saying that two suspected terrorists had been “neutralized” after the attack at Sharona market, while Haaretz reported that the suspects had been taken into custody. God have mercy on the victims of this atrocity and their families. To them, of course, it’s little solace that most people in Israel were unharmed. My girls, posing and mugging in Tel Aviv. This entry was posted in Personal, Terrorism, The World, Travel on June 9, 2016 by Brad Warthen. I’m glad that they are safe. And yeah, that’s what it’s like. And when you have five kids, and five grandchildren, your heart can be in a lot of interesting places at once.